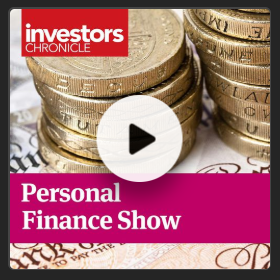 IF THERE is any wisdom in crowds, savers and equity investors might want to take note, writes Adrian Ash at BullionVault. Gold buying among private investors has leapt on the metal's drop in price, while the number of investors selling bullion has sunk to the lowest level in nearly 10 years. The last time so few people chose to sell gold was August 2008, eve of the worst global economic slump since the 1930s when the Western banking crash flipping into uncontrolled crisis with the failure of Lehman Brothers. While last month's action was clearly spurred by the drop in gold prices, it shows strong conviction among private investors already owning gold to keep and add to their bullion holdings. Customers repeatedly tell us their prime motivation comes from gold's historic role as investment insurance, gaining when other assets fall. Lower prices therefore offer cheaper insurance for these long-term investors wanting to spread their risk. And gold prices fell in July to their lowest monthly average in a year, down 7.2% from April's 20-month high in US Dollar terms. In response, the number of gold investors choosing to sell across the month fell 10.8% in July from June, down to the lowest level since August 2008. BullionVault was then one-fifth its current size. Gold buyers on BullionVault meantime grew 23.5% last month to outnumber sellers by more than 4.4 to one – also the most extreme reading in 10 years. 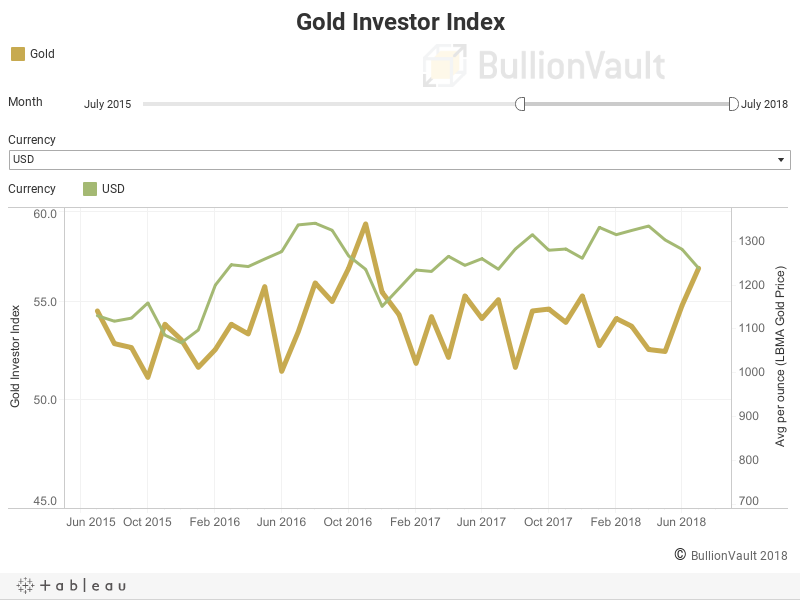 Together that took the Gold Investor Index – a unique measure of sentiment built solely from actual trading on BullionVault – up from 54.8 in June to 56.8, the highest reading since Donald Trump won the US election in November 2016. 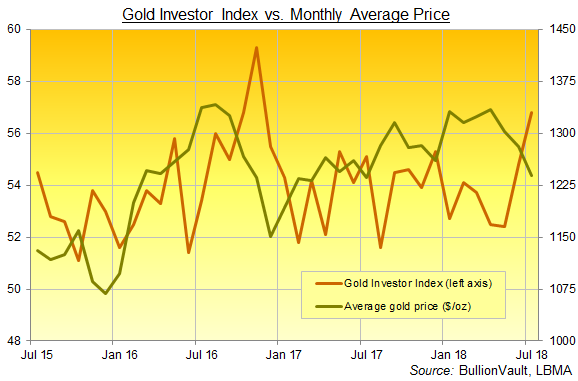 The Gold Investor Index shows the balance of net buyers over net sellers across the month as a proportion of all owners at the start, rebased to 50. The index hit a series high of 71.7 as gold prices peaked amid the US and Eurozone debt crises of September 2011, immediately after that summer's rioting across English towns and cities. It bottomed at 50.5 as gold prices hit multi-year lows in the winter of 2014-2015, and has since switched to showing a strongly inverse relationship with prices, rising as prices fall or vice versa in 18 of the 21 months following Donald Trump's election as US President. With prices falling in July 2018, Eurozone investors led the surge in demand, with a ratio of more than 6.1 net buyers for every net seller as gold priced in the single currency fell to its cheapest month average since January 2016. In total, private investors using BullionVault's online market and smartphone apps bought more than 339 kilos between them net of client selling, the heaviest 1-month addition since December. 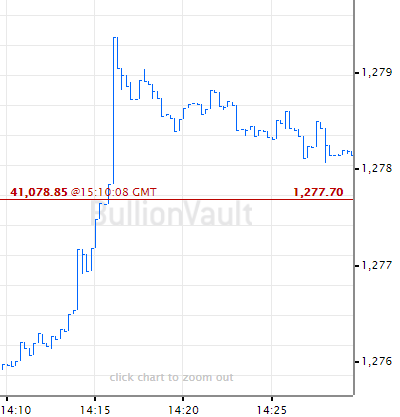 That took BullionVault client gold holdings to a new record above 39.0 tonnes. 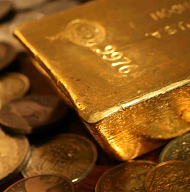 Stored in specialist vaults in the client's choice of London, New York, Singapore, Toronto or (most popular) Zurich, that makes a larger hoard than the metal held to back all but four of the 17 gold ETF trust funds listed in North America. In contrast however to this conviction buying among existing gold owners, new interest remains weak. With global stock markets struggling to set new all-time highs, that suggests complacency in the broader financial outlook. Data from Google Trends show the volume of searches for the phrase 'buy gold' edged higher last month from June's 11-year low. But it held one-third below the average level of the past decade, reaching barely half the average of 2008-2012. The number of first-time buyers on BullionVault also rose for a second month in July, recovering 8.1% from May's 4-year low. But it remained 30.5% below the last 12-month average, and 36.5% below the previous half-decade's typical level. As with gold, silver last month found the fewest sellers since August 2010, when BullionVault clients held just one-tenth the quantity they own today. 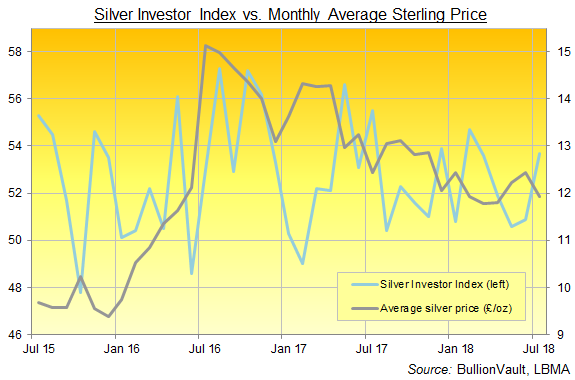 BullionVault's Silver Investor Index rose to a 5-month high of 53.7 from June's 50.9 as prices fell 4.9% to the lowest monthly Dollar average since March 2016. 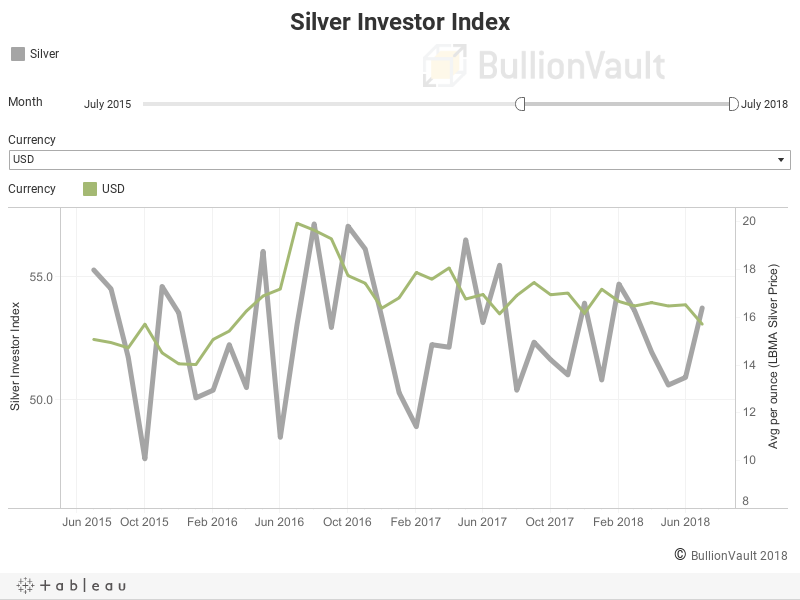 By weight users of BullionVault bought just over 5 tonnes of silver net of client selling, the strongest 1-month addition since March this year. That took total client silver holdings up to a new record of 727.8 tonnes, larger by almost one third (31.8%) from when Dollar prices were last this low. BullionVault users may not map the wider picture exactly. But they do represent the world's largest single pool of self-directed gold investors, and other bullion providers report a jump in retail investment demand last month as well. Data from the US Mint show a 42.9% rebound in its sales of new American Eagle gold coins from June. 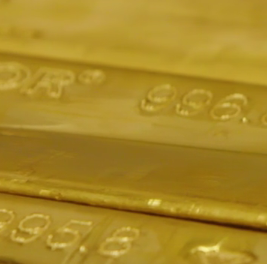 Australia's Perth Mint reported gold sales up 77.6% for the month by weight. In the main, both manufacturers deal with distributors, not the investing public directly, and their data can't show the level or trend in investor selling. But again, their figures support the headline move in our Gold Investor Index. They also agree with BullionVault users that professional investors are calling this wrong. People who get paid to invest money for others stayed away from gold on July's price-drop. The largest gold-backed trust fund, the SPDR Gold Shares (NYSEArca:GLD) shrank 2.3% as investors liquidated stock last month. Professional speculators meantime laid their heaviest negative bets on the metal – net of that group's bullish bets – in at last 12 years according to data from US regulator the CFTC. That speculation on prices going down no doubt helped feed the drop. Long-term investors who have already found their way to gold are only too happy to accept the resulting discount.